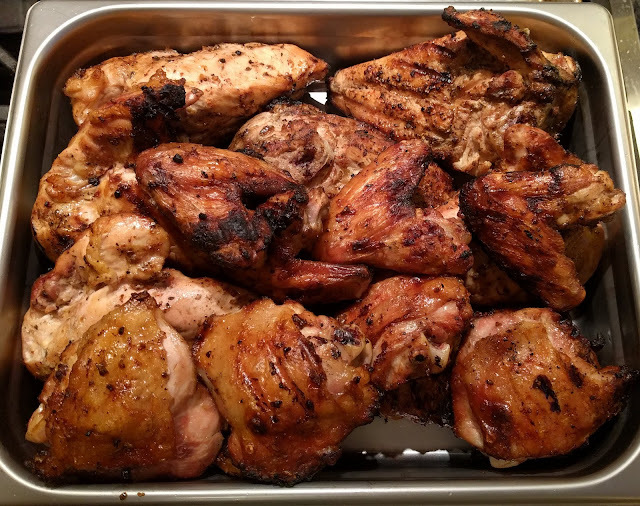 This is my go to, regular, boring old method for grilling chicken that I use nearly every Friday. It requires constant periodic attention to the grill--every 5 or 6 minutes--but the results are consistent and delicious. I like to season the chicken about 8 hours prior to cooking it. This allows flavors to penetrate into the meat, and a slight dry brining effect with the salt in the seasoning. If you are using kosher birds, DO NOT use a seasoning mix with salt in it. One other note about how I prepare the chicken breasts. My mother always removed the ribs and sterna from the breasts for ease of eating, however this requires more delicate cooking. I also remove the skin from the breasts along with the ribs, so the seasoning is directly on the meat. 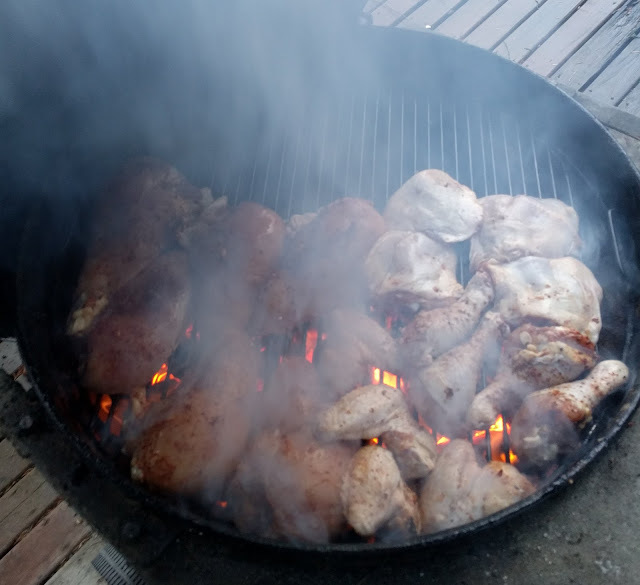 One hour and 15 minutes light a full canister of charcoal and when ready, spread it over a large front 2/3 of the floor of grill. Leave the back 1/3 of the grill free of charcoal to give yourself a space to put large pieces to indirectly cook after direct cooking. 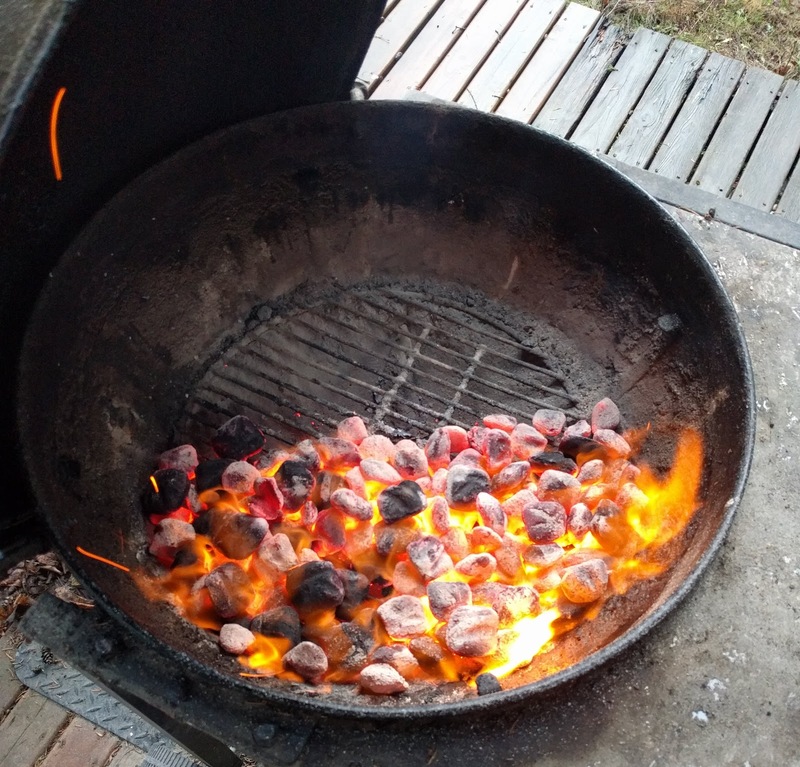 Place the cooking grate over the coals, and cover (with vents wide open) for about 3 minutes. Scrape down the grate, then coat with vegetable oil using a paper towel and some tongs. In the picture above, I have the meat from 2 whole chickens plus 2 extra breasts. The backs, necks, hearts, gizzards, and livers were used for soup this time. I place all the breasts together on the left, then the wings, then the legs and thighs on the right. 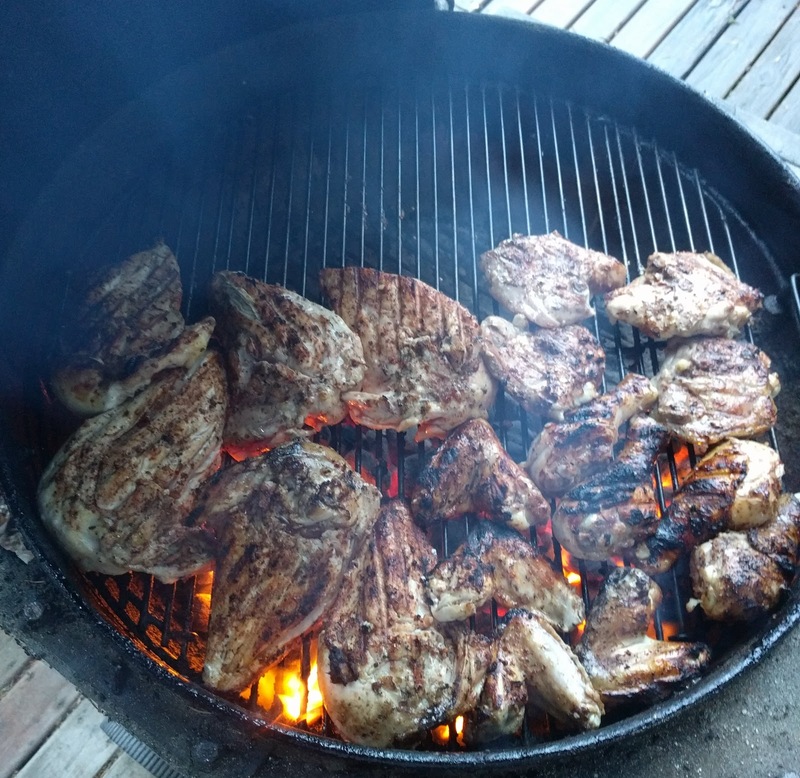 I try to nest the pieces together to optimize space on the grill, and it helps with flare ups. Cover and cook for 5 minutes. Turn the chicken. 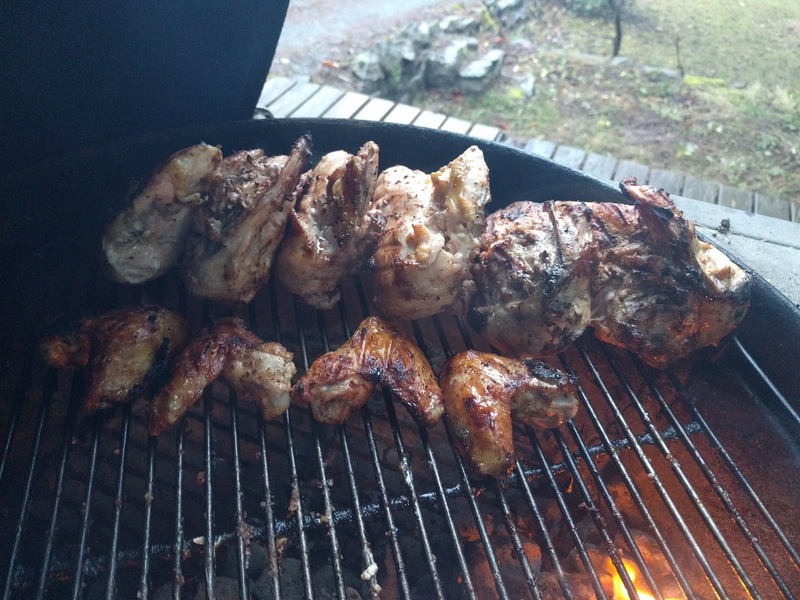 I like to not only turn the breasts over, but also rotate them to evenly grill the exterior. Cover and cook for 5 minutes. 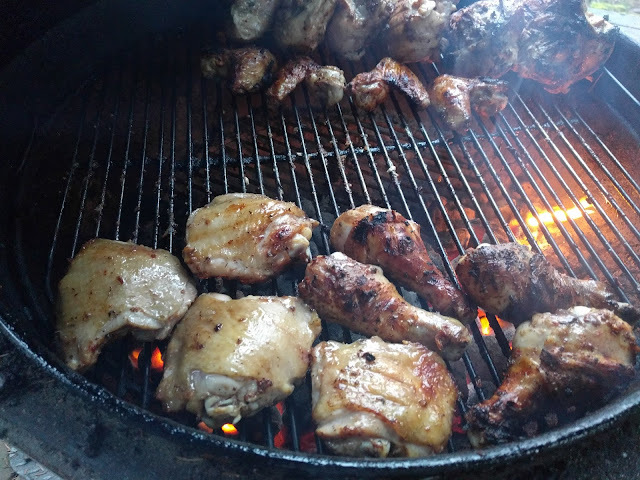 At this point, I move the breasts to the cool side of the grill to cook indirectly, and move the thighs to the spot vacated by the breasts. If the wings skin is crackly brown, move them to the indirect side as well. I stand the breasts on the sternum side, with the scapula bone pointing upwards. Cover and continue turning the dark meat every 5 or 6 minutes until done. This will take about 20 to 25 minutes. The breasts are fully cooked when you see clear juices pooling in the indentation next to the upturned scapula. However, don't let your eyes be the only judge--use a meat thermometer. Breast meat is fully cooked with an internal temperature of 165 degrees. I cook the Thighs and legs to 175 degrees. DO NOT SERVE UNDERCOOKED CHICKEN! The dangers of Campylobacter and salmonella are not to be underestimated. Plate your chicken and serve. I like to serve it with a bowl of my spicy sweet BBQ sauce for dipping.